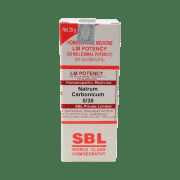 Natrum carb used for debility caused by summer heat, chronic effects of sunstroke, exhaustion, anæmic, milky, watery skin. Feels too large. Oversensitive of hearing. Headaches with the return of hot weather. Vertigo from exposure to the sun. Feels swollen and sensitive. Ill effects of drinking cold water when overheated. Water-brash. Hungry at 5 am. Very weak digestion, caused by slightest error of diet. Averse to milk. Depressed after eating. Dyspepsia relieved by soda biscuits. Sudden call to stool. Escapes with haste and noise. A yellow substance like the pulp of orange in discharge. Diarrhœa from milk. Induration of cervix. Bearing-down sensation. Heaviness, worse, sitting better by moving. Menses late, scanty like meat-washings. Leucorrhœal discharge, offensive, irritating preceded by colic. Old sprains. The great weakness of limbs, especially in morning. Easy dislocation and spraining of ankles. Soreness between toes and fingers. Heel and tendo-Achilles affected. The hollow of the knee is painful in motion. Icy cold up to knees. The inclination to perspire easily, or dry, rough, cracked skin. Eruption on finger-tips, knuckles, and toes. The vesicular eruption in patches and circles. Veins full. Soles of feet raw and sore. Dose: As prescribed by the physician. Can be taken with allopathic medicines. Maintain half an hour gap between food/drink/any other medicines and homeopathic medicine. Avoid any strong smell in the mouth while taking medicine e.g. camphor, garlic, onion, coffee, hing. 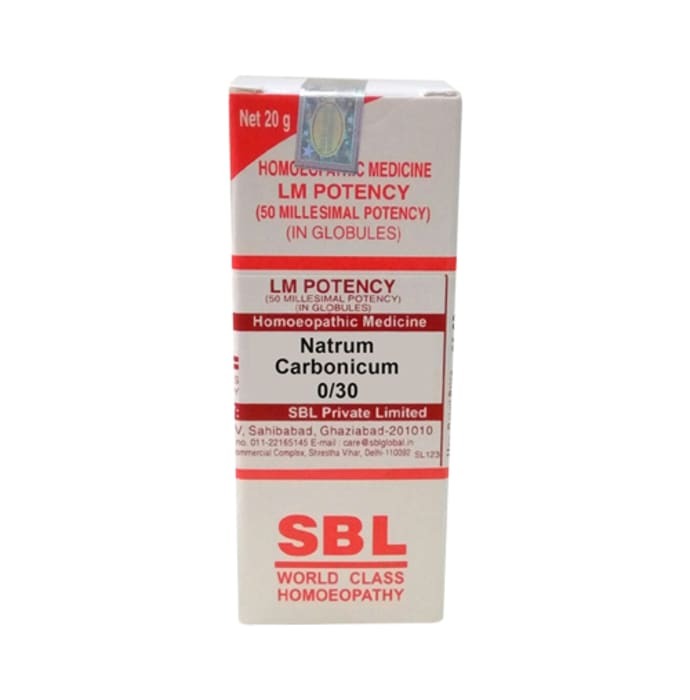 A licensed pharmacy from your nearest location will deliver SBL Natrum Carbonicum 0/30 LM. Once the pharmacy accepts your order, the details of the pharmacy will be shared with you. Acceptance of your order is based on the validity of your prescription and the availability of this medicine.